Eurosatory is the premier defense and security exhibition. With over 1570 exhibitors, forty international delegations and 57,000 visitors expected, the 26th edition promises to be exceptionally eventful. This edition of Eurosatory, will take on new significance as the family-owned group, which has been exhibiting since the trade fair's debut, will be celebrating its 170th anniversary and showcasing numerous innovations and concepts with originality. 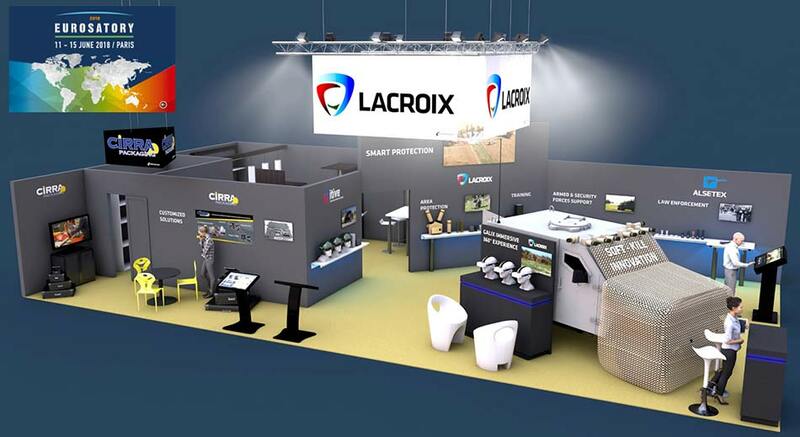 At our newly designed, can't-miss stand, visitors will enjoy, among others, an immersive 360° experience of the deployment of Galix self-protection masking from our demonstration/mobile test vehicle, a light armoured protected vehicle, as well as the new realistic pyrotechnic simulation systems (REPY), which was developed with the help of the DGA to fulfill land forces' training requirements. 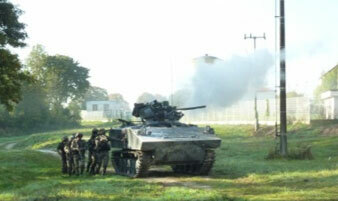 LACROIX developed the GALIX vehicle self-protection system, deploying smoke masking in the visible and infrared (IR) domains for protection against hostiles. Galix currently equips over 15,000 platforms (armored and non-armored) in France and abroad. During Eurosatory 2018, visitors will have the opportunity to assess the Galix system's interoperability capabilities with various sensors (LWS, acoustic, etc. ), and to enjoy an innovative and unique experience through the Galix "360°IMMERSION" demonstration. From within or outside our light armoured protected vehicle (1st mobile and operational test vehicle for trials, research and customer demonstrations, etc. ), the spectator will have a unique opportunity to experience an immersive, self-protection firing sequence! Following the CENTAURE program, Lacroix will be taking part in the new CERBERE program for the next 20 years with REPY, a new, realistic pyrotechnic simulation system and its new range of effects. Unveiled during Eurosatory 2016, the 1st concept and systems have evolved to satisfy current program requirements, and the final versions will be presented for the first time during this latest edition. REPY simulators can be as easily employed in training centers as in live fire exercises (CETIA, CENZUB, etc.) on vehicles or on the ground by coupling them to targets or simulators. The 2018 edition of Eurosatory takes on historical significance for the Etienne Lacroix Group: 170 years of pyrotechnic passion ! Established in the area of Toulouse since 1848, the Etienne Lacroix Group has a long history in manufacturing fireworks and staging shows, and has been able, through the decades (and centuries), to grow, innovate and diversify. 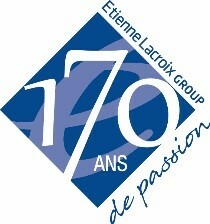 170 years later, Etienne Lacroix is now a major player in the pyrotechnics field and its ecosystem: fireworks displays and international shows, defense, civil safety and law enforcement, armed and security forces support, packaging and plastics processing, transport and logistics, etc. As regards defense, it was at the end of WWII that the group, managed by Roger Barès, took a decisive and visionary turn, to enter the defense pyrotechnics market. Its first contracts were signed in the 1950s. 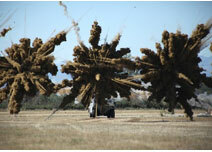 Air, The company has developed the world's largest range of infrared (IR) and electromagnetic (EM) decoy flares. The Group equips numerous war and transport planes as well as helicopters with its countermeasures. 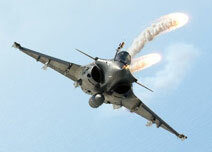 The latest generation aircraft, such as the Rafale, l'A400M, and Tigre are protected with Lacroix's countermeasures. 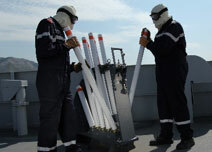 Naval, Over the last 10 years, Lacroix's R&D department developed no less than 3 decoy flare launchers (SYLENA). Hundreds of naval platforms around the world employ Lacroix munitions and systems, spanning from the older classes of corvettes and frigates to the latest platform designs and concepts. Land, the company contributed to vehicle protection solutions with Galix, offering multi-band coverage (visible and IR), this system equips thousands of armored vehicles from 4x4s to combat tanks. Lacroix also provides defense devices, combat training systems, signalling for the SAR teams, etc.